Glacier Bay National Park is the jewel of America’s National Park System. Over three million acres include an incredible variety of terrain to explore, including bays, coves, grounded glaciers and tidewater glaciers. This article is an example of typical anchorages and activities available on one of our sailing trips this magnificent landscape. 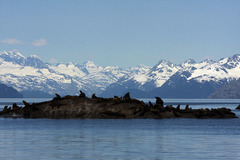 Our Glacier Bay tours are customized to your interest and what wildlife may be present each day. 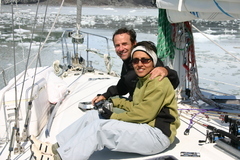 The National Park Service, Department of the Interior authorizes Sound Sailing as a Concessioner to provide Charter Vessel Services within Glacier Bay National Park. Your Glacier Bay tour typically starts when we meet on the morning of our departure at Auke Bay Harbor, north of Juneau’s airport. Once you and your bags are on board, we’ll do a brief orientation to get you settled into your cabins and familiarize you with the boat and the area we’ll be exploring. 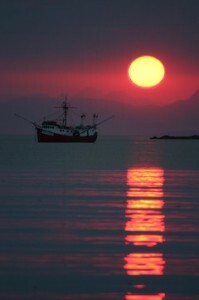 Once everybody is ready, we’ll cast off the dock lines and head away from traffic, airplanes, and civilization. If the weather cooperates, we may get a glimpse of Juneau’s famous Mendenhall Glacier as we glide through the aqua waters of Auke Bay. Passing Shelter Island we enter Saginaw Channel. If we haven’t already spotted any humpback whales, this is probably where we will see small groups of humpbacks cruising through the channel looking for lunch. As Sailboat BOB rounds the northern tip of Admiralty Island, we usually get a nice view of the white buildings and red roofs of the Point Retreat lighthouse. Behind us we can also see the Herbert and Eagle glaciers creeping down the slopes of the coastal mountain range. Our Glacier Bay Tour destination tonight is Flynn Cove, a quiet bay on the northern shore of Chichagof Island. 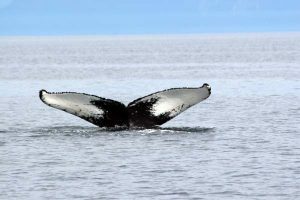 Anywhere along the way we might see humpback whales, orca, Dall’s porpoise, Steller sea lions or harbor seals in addition to a multitude of sea birds. If there’s enough time we may stop to fish for halibut or salmon; if we get a favorable wind we’ll enjoy the sights under sail. We duck into Flynn Cove in late afternoon and run to the head of the bay to drop the anchor. The cove is open to the west and we’ll have a nice view of the Fairweather Mountains and the sunset (weather permitting). If anyone is interested in taking the double kayak out for a paddle, there are some interesting nooks and crannies to explore in this calm, protected cove. On day 2 of our Glacier Bay Tour, we have breakfast on our way from Flynn Cove to Point Adolphus. The point juts out into Icy Strait, where the currents of Icy Strait concentrate feed in this area. 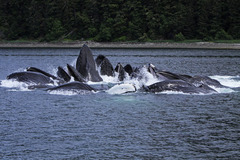 Salmon, halibut, eagles, sea lions, and humpback whales all congregate here to feed. We shut down the engine and let the current carry us along as we sit on the deck to watch the multitude of wildlife around us. Schools of herring boil on the surface of the water as a school of salmon attacks them from below. Diving birds wheel and cry overhead, plunging into the water and nabbing their fair share of the bounty. A small pod of humpback whales work the area with their cooperative bubble-net feeding, lunging through small schools of herring and candlefish, mouths gaping wide as they strain the fish out of the water with their amazing baleen filters. After we round the point, we anchor close to shore for lunch. The air is still, the water flat and calm. The cries of bald eagles pierce the air and the sound of whales spouting around the corner echo as if they are still right next to us.The wind fills in from the west, so we secure the lunch dishes, retrieve the anchor, hoist the sails, and reach across Icy Strait towards Glacier Bay. The westerly wind comes behind us as we sail into Bartlett Cove, eventually dropping our sails and motoring into the dock. Bartlett Cove is headquarters for the park. There are trails, exhibits, guided hikes, and the Glacier Bay Lodge itself to explore this afternoon. 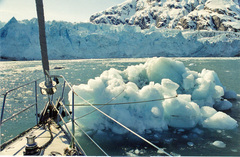 After dinner, there are also talks, slide shows, and movies about Glacier Bay for those interested in attending. Whenever the crew is ready to leave the dock we will anchor out for the night. The anchor comes up early as we leave Bartlett Cove to catch the tide flooding into Glacier Bay. We must work with the tides, as currents can run up to 8 knots (which is faster than our cruising speed) through the narrows. With the current pushing us, we’re making 12 knots over the bottom as we motor up the bay on another calm morning. Our first stop is at the Marble Islands to see a Steller Sea Lion rookery. The rocks are covered with these great flippered beasts, and we can see and hear the huge bulls (up to 2,000 pounds) defending their harems from any other male who happens to venture too close. Kittiwakes call out from their nests, which adorn every crack and crevice on the sheer rock walls of the island. 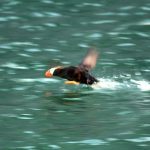 Crested and horned puffins transit the air and water around us. Bald eagles soar overhead and we can see others perched in snags at the water’s edge. After drifting around the islands for a while, we decide to sail over to Drake Island for lunch. We anchor off the island and drop some fishing lines over the side. A large raft of sea otters swim by (a group of sea otters is called a raft, even if they are not bound together). Several of the females have fuzzy pups held tightly to their stomachs as they glide by effortlessly on their backs. There are no other boats in sight as we take in the towering mountains and glaciers surrounding us. Just when we thought things couldn’t get any better, a nice 30-pound halibut grabs the herring dangling above the sea floor from one of our fishing poles, and we have an instant menu change for tonight’s dinner. 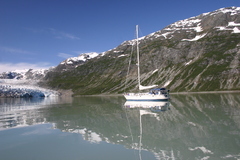 Our evening anchorage is Shag Cove, a narrow, deep fiord with heavily wooded slopes. As we enjoy quietly swinging on our anchor, a black bear sow with two cubs works her way around the edge of the cove. We hear the distant call of a couple of wolves, and just before everyone retires for the evening three wolves trot out of the forest, swim across the stream at the head of the bay, and disappear back into the woods. Today is a long travel day as we continue to explore Glacier Bay. We typically get calm conditions or light northerlies, so we’ll motor for about 6 hours to get to the Marjorie Glacier in Tarr Inlet. As we leave the heavily forested Shag Cove, it seems as if we move back in time with each passing hour. The mature rain forest gives way to a more brushy terrain. Along the way we make a brief stop along the steep rock faces of Gloomy Knob. There are colonies of kittiwakes nesting along the cliffs, and we also find some puffins and pigeon guillemots swimming in the calm waters at the base of the rocks. Looking with the binoculars, we even see a small herd of mountain goats moving across the seemingly impassably steep rocky face. 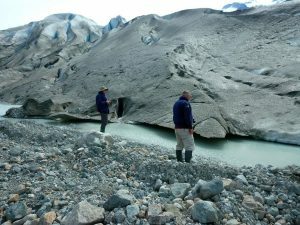 We cut inside Russell Island and pass an impressive alluvial flood plain coming out of a valley whose glacier has retreated out of sight. Just as we enter Tarr Inlet we see a brown bear sow with three cubs scavenging along the shore. We drift alongside them for half an hour, watching and listening, our engine off, until the bears gradually disappear into the brush. As we continue up the inlet more and more icebergs crowd the water until we have to slow down to an idle in order to work our way through them. We pick our way up to the Marjorie Glacier, cut the engine, and drift along in front of the 200-foot-tall face of the glacier. Craggy spires of blue ice tilt at different angles. The ice constantly pops, cracks, and groans with periodic calving of ice. Each of us makes a guess as to which spire will crash down next, noting where the “small” pieces of ice seem to crumble into the water the most. Eventually several chunks of ice adjacent to one of the huge spires tumble to the water, causing more ice to break away until the grand spire itself teeters and then collapses, thundering into the water. The water erupts with the force of the collision, and sets off a huge swell that radiates out into the arm, rocking our boat in its wake. The sea birds swarm around the gash of ice, now deeper blue where the spire has just jettisoned, as they pursue the freshly exposed invertebrates which the churning water has exposed. After a few hours of watching the glacier work its magic, we use our landing net to scoop up some cocktail ice (ice that is hundreds of years old) and motor slowly along the shore. Once again we see kittiwakes and puffins nesting along the cliffs as we move past them. We find a spot to anchor off the mouth of a small stream and enjoy the solitude of ice, water, and majestic mountains surrounding us. We listen to the sound of water tumbling off the steep cliffs, the distant din of the kittiwake colonies, and the occasional cry of a bald eagle as we enjoy the view of the surrounding mountains. At times we can hear the distant thunder of more ice as it crashes down from the glacier’s face a mile away from our anchorage. Morning finds us surrounded by icebergs that have calved off the Marjorie during the night, some of them gently nudging our hull. 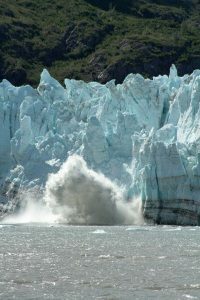 Today we will travel up to the end of Glacier Bay to view the John Hopkins glacier, one of the few glaciers in the park that is still advancing. Like yesterday there is no wind, and the water in the arm is calm and glassy smooth. We motor along the arm, still in awe of the rugged mountains, glaciers, and waterfalls that surround us. We turn the corner at Jaw point and motor into another area full of icebergs. Although we’re five miles from the face of the glacier we can see it clearly at the end of the inlet as we slow to maneuver our way through the ice. 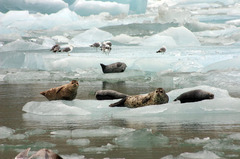 We spot clusters of harbor seals, some with this year’s pups, hauled out on the ice floes. retreated from the inlet, but is grounded just past the high tide line. It’s possible to walk up the shore of the inlet to explore the outflow streams and get a close look at the ice. Some people choose to go ashore for a hike while others opt to explore the inlet in the kayak. After breakfast we motor out of Reid Inlet to start our trip down the bay. As we cross over the bar a light northerly wind fills in, so we raise the sails and sail slowly and silently down the middle of the arm. As usual, we are surrounded by breathtaking scenery as we slip past mountains, glaciers, and more inlets. Our sail takes us about halfway down the bay and we anchor to enjoy lunch and a little halibut fishing. After eating lunch and cleaning fish it’s a short 30-minute run under power to North Sandy Cove, where we anchor for the night in a narrow passageway. We are in luck—before the evening is over, we’ve seen three different black bears, and one moose. It’s time to leave Glacier Bay and head back towards Juneau, so after breakfast we raise the anchor and head south for Icy Strait. Again, we time our departure to catch the ebb tide out of the bay, and as we fly across the bottom at 10 knots, we watch for sea otters and humpback whales. We also see some sea lions and several types of sea birds including puffins(!). Leaving the park, we cut inside of Pleasant Island through Icy Passage. Here the current is against us as we motor past the new dock for Gustavus. Another hour finds us tying up at a dock near the Excursion Inlet cannery. Ashore, we hike around the cannery grounds and take in the museum. Excursion Inlet was originally built as a barge terminal for the US Army to get supplies to Alaska during World War II. The huge complex was almost completed when the war ended and German POWs were brought in to dismantle the camp. Today it’s a pretty busy place with fishing boats coming in to offload their catch and a few small planes landing on the gravel strip. We have a long run towards Juneau, so after breakfast we cast off our dock lines and motor east through Icy Strait. We pass a group of humpback whales bubble-net feeding off the shore and stop to watch them feed on the schools of candle fish we see breaking the surface of the calm water. When it’s time to move on, we move off slowly and put the downriggers down to see if there are any salmon around. By the time we get to Pt. Couverden, we have two nice silver salmon for dinner on the stringer behind the boat. It’s still another four-hour run to our anchorage in Lena Cove, so we bring the fishing lines in and push on. We cross Chatham Strait and run along the shore of Admiralty Island. Almost to Point Retreat, we run across a pod of three Orca and we follow along as they cut through the water. They don’t seem to be in any hurry, changing directions, doubling back, splashing the water with their tail flukes, and one of the adolescents occasionally breaches all the way out of the water! It’s the last day of our Glacier Bay tour and an hour’s run into bustling Auke Bay Harbor, so we leave the anchorage early and have breakfast as we motor in. There is time to shower for those who are so inclined and the time passes quickly as everybody gets their gear organized and packed for their trip home. We get to the loading dock around 9AM. Some people are headed directly for the airport and a flight home; others have chosen to spend the night here in Juneau to take in more of the sights. It’s been a magical trip of wildlife, scenery, and camaraderie, and we all say our goodbyes as transportation arrives to carry each person off, whether to the airport and home, or back into Juneau where the more adventure awaits. 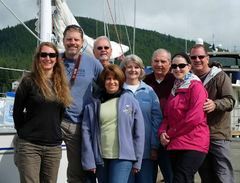 Another crew has now been indoctrinated on the BOB, and we look forward to exploring more of Southeast Alaska with them again in years to come.